We don’t understand the recent controversy surrounding the zombie image of Barack Obama. For one thing, an image similar to the one that’s getting everyone riled up has been around for some time (see Jared Moraitis’ Obama zombie design at BeastPop Arworks). I think the real travesty here is that it took Democrats this long to become aware of the zombie Barrack Obama image in the first place. Ok, sure, Virginia Republicans might have added a little bullet hole in the more recent Halloween image, but how else are you going to put down a zombie…especially one as thick headed as Barrack Obama? 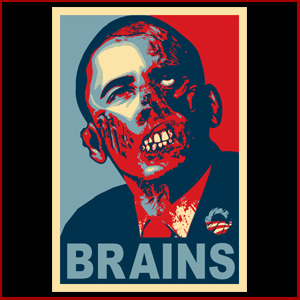 At any rate, here are some Barrack Obama zombie images to feast your eyes on or get worked up over (the first of the bunch being the most controversial).